On the 14th (Fri), browse the eclectic array of goods at Kapali Carsi. Here are some ideas for day two: take a stroll through Ortakoy, then admire the masterpieces at Istanbul Modern Museum, then take in the spiritual surroundings of Hagia Sophia Museum / Church (Ayasofya), and finally contemplate in the serene atmosphere at Sultan Ahmed Mosque. To see other places to visit, ratings, photos, and tourist information, read our Istanbul trip itinerary app . Cairo, Egypt to Istanbul is an approximately 5.5-hour flight. You can also do a combination of flight and bus; or drive. Traveling from Cairo to Istanbul, you'll lose 1 hour due to the time zone difference. Traveling from Cairo in September, expect nights in Istanbul to be about the same, around 26°C, while days are cooler, around 26°C. Finish up your sightseeing early on the 16th (Sun) so you can travel to Marmaris. One of Turkey's major port towns and tourist resorts, Marmaris sits on the stretch of the Mediterranean coastline popularly known as the "Turkish Riviera." Nestled between verdant mountain ranges and the sea, Marmaris draws sailors and divers from around the globe, its marinas packed with private yachts and tour boats. 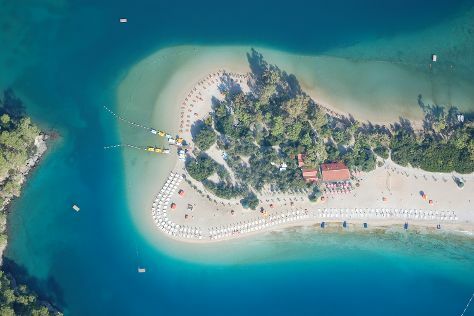 On the 17th (Mon), tour the pleasant surroundings at Marmaris Beach, enjoy the sand and surf at Icmeler Beach, and then stop by Latina Goldsmith. Keep things going the next day: make a splash at Marmaris Atlantis Waterpark and then explore the activities along Dalyan Nehri. 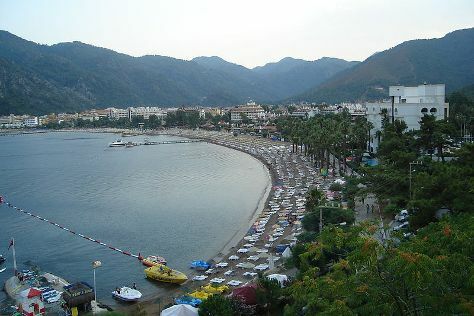 To find more things to do, maps, where to stay, and other tourist information, you can read our Marmaris trip planner . Traveling by combination of flight and bus from Istanbul to Marmaris takes 6 hours. Alternatively, you can do a combination of shuttle, flight, and bus; or drive. Traveling from Istanbul in September, expect nights in Marmaris to be slightly colder, around 20°C, while days are a bit warmer, around 34°C. Finish your sightseeing early on the 18th (Tue) to allow enough time to drive to Kas. An unspoiled fishing village for most of its existence, Kas now serves as a mostly quiet tourist town, located on the southern section of the country's Mediterranean coastline. 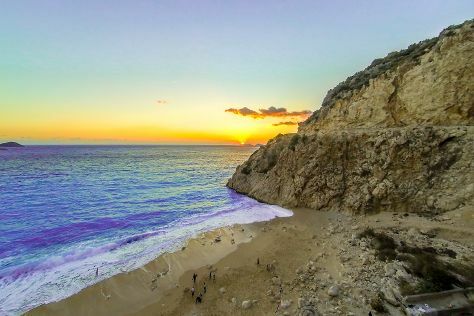 Start off your visit on the 19th (Wed): enjoy the sand and surf at Flora Boat, then make a trip to Lions Tomb, and then enjoy the sand and surf at Kaputas Beach. Here are some ideas for day two: discover the deep blue sea with a scuba or snorkeling tour. For where to stay, maps, ratings, and tourist information, read our Kas trip planner. Traveling by car from Marmaris to Kas takes 3.5 hours. Alternatively, you can take a bus. Expect a daytime high around 34°C in September, and nighttime lows around 20°C. Finish up your sightseeing early on the 20th (Thu) so you can go by car to Fethiye. A prosperous hub of tourism on the Mediterranean coastline, Fethiye boasts one of Turkey's finest natural harbors. On the 21st (Fri), kick back and relax at Calis Beach, wander the streets of Old Town, and then explore the activities along Oludeniz. For reviews, where to stay, traveler tips, and other tourist information, use the Fethiye tour itinerary planner. Traveling by car from Kas to Fethiye takes 2 hours. Alternatively, you can take a bus. In September, daily temperatures in Fethiye can reach 34°C, while at night they dip to 20°C. Wrap up your sightseeing on the 21st (Fri) to allow time to travel to Goreme. Escape the urban bustle at Goreme National Park and Gulludere Vadisi. You'll explore the less-touristy side of things at Balloon Rides and Uchisar Castle. 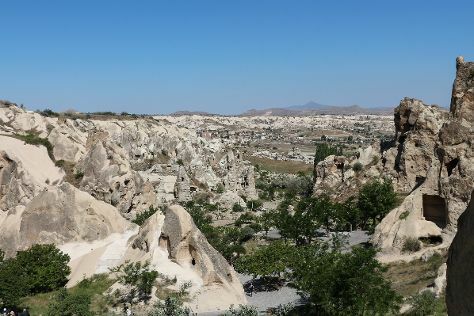 And it doesn't end there: take in the dramatic natural features at Fairy Chimneys, explore the fascinating underground world of Cappadocia Cave Dwellings, and stop by Orient Bazaar. To see traveler tips, more things to do, reviews, and tourist information, read Goreme vacation planner. Do a combination of bus, flight, and taxi from Fethiye to Goreme in 6.5 hours. Alternatively, you can do a combination of bus and flight; or drive. Plan for slightly colder nights when traveling from Fethiye in September since evenings lows in Goreme dip to 13°C. Wrap up your sightseeing on the 24th (Mon) to allow time to travel back home.